You have always wanted to join a live aboard charter to the amazing Galapagos Islands. 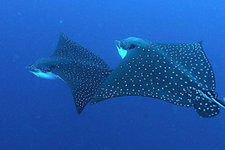 Now you can join a charter in January 2013 to this fin-tastic dive destination and save $1,000 per person. Your 8 day / 7 night underwater adventures in the Galapagos will encompass everything from sharks to nudibranchs, and more. The islands are best known for amazing shark diving around Wolf and Darwin Islands. Your diving experience here will generally include Galapagos sharks, silky sharks and lots of schooling hammerheads being cleaned by king angelfish. Seeing marine turtles, schools of tuna, eagle rays, and sea lions are very common. All the islands are amazing sites for underwater photography. Besides the diving adventure on the Humboldt Explorer, you will have the opportunity to experience land tours that may be booked in addition to the cruise. Tour options include Otavalo Market and Cotacahi village, Cotopaxi National Park, and Mindo-Nambillo Ecological Reserve. The dive charter includes 7 nights/8 days aboard the vessel, 3 meals daily, plus between-dive snacks, alcoholic and non-alcoholic beverages, 2-3 dives a day (days vary), tanks, weights and belts. The charter does NOT include airport transfers (except same-day Galapagos arrivals), hotel accommodations, international flights to/from Galapagos, last evening meal, rental gear, instruction, nitrox and retail charges, crew gratuities, dive accident insurance (required), trip cancellation insurance, premium alcoholic beverages, National Marine Park fees - $100 pp, cash only. Paid on arrival in Galapagos, TCT Tourist card - ($10 pp, cash only) Paid at Ecuador airport of departure for Galapagos. Cash only, hyperbaric chamber fee ($35 pp, payable on board), and fuel surcharge.